So I am the climbs convener for the UCT MSC, the cable car company has approached us and the MCSA and asked if we would be willing to help clean up rubbish in the hard to reach areas around the top cable car station. This means some people will be scrambling around the ledges below the stain and others abseiling in and collecting garbage on the ledges below the cable station. If you are keen to come along and help us on the day it would be greatly appreciated by the cable car people but more importantly other climbers and the mountain! We will be doing the clean up this Wednesday (21st) its a public holiday. The plan is to catch a lift up on the cable car (they will sponsor tickets) abb down collecting garbage along the way, then climb back up or more lightly walk round fountain ledge back up to the top station and catch a lift down. We will be meeting at 8:30 on Wednesday Morning, and are hoping to be done by lunchtime. If you are keen to help pleas let me know, as I will have to arrange tickets and other logistics. The info I need is: name, cell number, climbing experience (little or none is ok), gear you have and e-mail address. Pleas e-mail me these details. Anybody coming from Tableview side can let me know if they want to liftclub, there are two of us coming from this side afaik. great article (and great effort) by the UCT MSC and the MCSA. Some of you will remember the great success we had at the Table Mountain Cleanup (TM Cleanup) last year, well we are doing it again! For those of you who don't know about it, the cable car company has approached the climbing community and asked if we would be willing to help clean up rubbish in the hard to reach areas around the top cable station. Their staff clean the area on the top but plenty gets thrown or blown off and ends up in the crags surrounding the top cable station. We abseil in and collecting garbage on the ledges around the cable car. Many of us spend a lot of time on the mountain, now is your opportunity to get involved and give something back to the the mountain we love. We are looking for as many volunteers as possible, we will split into two main groups, abseil teams and walkers. For the abseil teams it is advised you have some experience on ropes and some knowledge of the area and some gear, if you are a bit short in some of theses areas don't stress we can pair you up with a more experienced climber. At the same time we send walkers down onto some of the more ‘exciting’ ledges that don't need ropes to access, so we need plenty people with a head for heights and knowledge of the area. The date is set for Thursday 21st March (Its a public holiday), the basic plan is the same as last year: we meet early at the lower cable station. The Cable Car Company will kindly give us a free lift up in a cable car we then split up into teams, collect all the rubbish we can and return around lunch time, leaving us the rest of the afternoon to climb or hike if we want. The Cable Car Company will give us a free ticket for the return journey as well. If you are interested please contact me I need your details. If you know of anyone who may be interested please pass this message on as well. 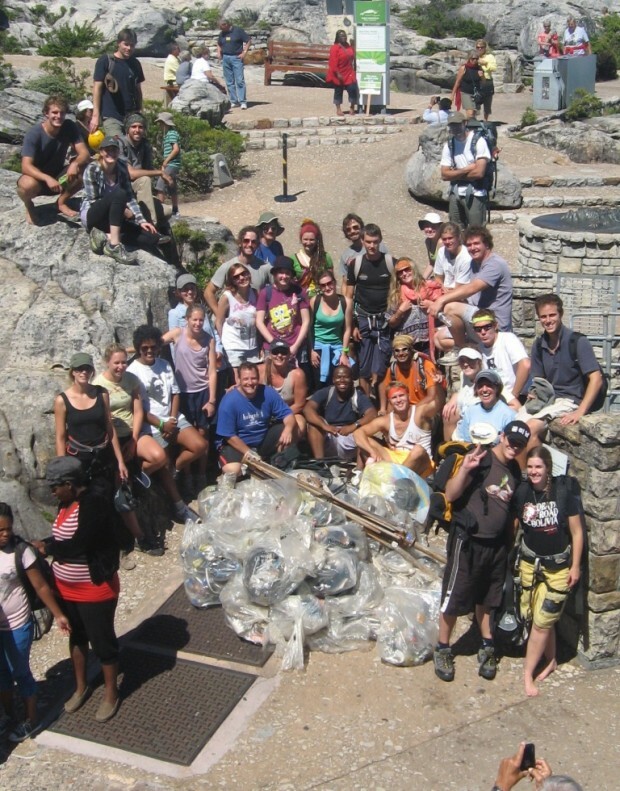 Well done and thanks to everyone who helped clean up Table Mountain - thats quite a bit of trash!!! Awesome - well done all and thanks for giving up a day to do this. I was up at the ledge on the weekend and it was squeeky clean - what a pleasure! Chris Laidler is organising another Table Mountain Clean Up this year. These have been well attended and very successful at removing rubbish from the climbing areas around the Cable Station. I have never, in my dear life, seen so much broken glass in a 'nature reserve'. I live in Obs, and I am sure everyone can agree that even in their respective neighbourhoods there is broken glass every where. But to enforce high impact environmental costs for conversation on a climbers when there are reprobates with alcohol - which TMNP endorses by selling. Please write an EMP, mitagation strategy for this please and declare who of TMNP's staff will go and clear this up. I doubt many, as its only climbers who have the 'privledge' of the mess others create. Nor would any staff dare walk off comfortably to the crag edges to retreive so much glass. I dont necessary disagree with permitting. But there should be transparency and perhaps a little more logic applied before knee-jerk control measures are applied. On Saturday 26th May 30 climbers from MCSA & UCT MSC, and some of their friends, got onto the ledges around the upper cable station to clean the ledges of litter that accumulates all too quickly. I managed to persuade John Wilson to be our photographer. It was highly successful with small teams allocated specific exposed areas. There were 2 parties of walkers cleaning broad ledges. A big thanks to City Rock for their sponsorship, TMACC for all the support, to all the climbers that came to do the job and John for capturing the event with his camera for us.